No matter how much we learn about music, there is always something additional to learn. But also, whatever our skill level, there’s always something we should already know but we missed or skipped. Those missing pieces limit our skills and our enjoyment in playing. We may not even realize there is something missing that could solve a problem or fill gaps you can sense but can’t quite identify. In my first 25 years of playing music, I used to assume I was too dumb to learn all the information other people knew, and got by pretty well without it, until I took up another new instrument and had to figure out for myself how it worked. I had missed a lot of information, partly because as a dyslexic I could not read the music notation and was kicked out of classical lessons, and partly because the only instruction available to me thereafter was by rote. I realized that if I had been taught certain concepts early on – independently of the printed page – it would have made learning any instrument much easier. Although I had an inherent sense of harmony, melody, and so on, I didn’t know why the things I did worked. Even among paper-trained musicians, I find that the most common missing pieces are the most basic ones. Such as: what makes a chord, how do you know what chords to use where, how do you find the notes you hear in your head, etc. etc. The collection of data that is referred to as music theory is usually taught on paper rather than directly on an instrument, and is assumed by many musicians as applying only to reading music. Actually, those concepts describe the structures of music itself – its frequencies, its sounds, and how to make music make sense. Most musicians learn music either by note or by rote, and either way there’s a lot missing. When you can read the music but you don’t know why it is what it is, that’s as much a handicap as learning by rote without being able to read. But if you understand and use the knowledge of music’s structures, you can do just about anything. You can enhance arrangements, you can compose, and you can do simple things too, like finding the right chords, use more interesting chord forms, transpose easily, and understand modes and how scales are set up. If you’re reading this you probably have a fair amount of knowledge of music in general. But how would you know what you’re missing? (You wouldn’t, because you missed it!) Although I cannot cover here the entirety of music strucure information, I can get you started. In a very general and simple way, allow me to guide you through a review of the basics. Let’s begin with terminology – if the first part is too elementary, read on – it gets better. If you have access to a keyboard, or to an instrument on which the diatonic (do-re-mi) scale is linear, this will be easier to visualize and hear. What is a scale? A scale is a sequence of notes. There are many kinds of scales used in different cultures and different applications. The easiest scale on a piano, for instance, starts on the C note and progresses thusly up the white keys: C, D, E, F, G, A, B, and C.
What is an interval? When two notes are played at the same time, the term “interval” refers to the distance between them. For instance, choose a note and call it “one”, and then choose another note and count how many notes of the diatonic scale (do-re-mi-fa-so-la-ti-do) there are between the two, including both of the notes you’ve chosen. The number you count is the interval. If, for instance, there are five notes, the interval is a fifth. If there are three notes, it’s a third. And so on. What are chords? A chord is three or more notes sounding together. There are many kinds of chords; the sequence of notes determines the exact type of chord in addition to its name. Thinking of your notes as numbers simplifies everything. You can, for instance, play a scale (in any octave), but call the notes 1,2,3,4,5,6,7 and 1. This is a “do-re-mi” scale, also known as a 7-tone, major, Ionian, or diatonic scale, which can be played in any key. In every key, the same numbers, in the same order, are still applicable. Simply assign the number 1 to the first note of any scale. The scale described above consists of a specific pattern of musical sounds called half steps and whole steps. In Western (rather than Oriental or Arabic) music, the half step is the smallest change in pitch we can make when moving from one note to another. A whole step is double the range of the half step. The 7-tone scale, on unlevered strings only, goes: whole step, whole step, half step, whole step, whole step, whole step, half step. If you have a keyboard handy, you’ll notice that you create a half-step raise in pitch when you play a white key and then the black key just to the right of it. Or if you’re on a chromatic fretted instrument such as a guitar, you get a half step when you play a note on one fret and then one fret higher. If you have a harp, you will also notice that the levered third and seventh string of any diatonic scale will give you the same note as the unlevered string immediately above them (the fourth and eighth string). If you start at C and play all your notes, you get C, C#, D, D#, E, F, F#, G, G#, A, A# and B – that’s twelve tones – before you get to the C an octave above where you started. The twelve-tone scale is also called the chromatic scale. It is composed of all half steps. You can get a chromatic scale in any key – in other words, you can start anywhere on a piano or a guitar and play a chromatic scale. The note you start on will be the name of the key. A triad is a three-note chord in which the notes are each an interval of a third away from each other. When playing a triad, the name of the chord is always the lowest note (the root). A triad with C as the lowest note, for instance, is a C chord (or a “one” chord, whch is expressed by the Roman numeral I). A three-note chord in which the notes are less or more than a third away from each other is not a triad. When referring to chords by their numbers, we use Roman numerals. I, II, II, IV, V, VI, and VII. This keeps us from confusing chord numbers with single note numbers. When we refer to note numbers, we use Arabic numerals 1,2,3,4,5,6, and 7. You can expand a triad chord to make a full chord. If you add the octave note (8) you will have a four-note or full chord. Like a triad, the name or number of the full chord in the root position (not inverted) is the name or number of the lowest note of the chord. You can also play open chords: if you play notes 1,3,5,8 and then take away note 3, what’s left is 1,5,8. This is very pleasing to the ear because of its uncluttered sound. The name of the chord is still the lowest note. You can also play expanded chords. If you place 1,5,8,3 (the 3 above the 8) it produces a very open and lovely sound. What makes a chord Major or Minor? If you play a 1 (let’s use C) chord in triad form, you will notice that it is made of two intervals of a third. Notice also that the lower third has two whole steps within it. In other words, C, C#, D makes two half steps (one whole step) and D, D#, E makes two more half steps (one whole step). Therefore the lower third of this chord contains a spacing of two whole steps. But notice that the upper third of this chord has only one and a half steps within it. From E to F is a half step; from F to F# is a half step, and from F# to G is a half step, equaling 1½ steps. There are more half steps in the lower third than in the upper third of this chord. A third with two whole steps (four half steps) is called a major third. A third with 1½ steps (three half steps) is called a minor third. When the major third is on the bottom of the chord, you have a major chord. When the minor third is on the bottom of the chord, you have a minor chord. I like to think of these this way: the major chord is bottom-heavy (more half steps in the lower third), and the minor chord is top-heavy (more half steps in the upper third). Chord I is a major chord. Play a chord containing notes 2,4,6. This is a II chord. Look at the number of steps in the bottom third and then in the top third. This is a top-heavy chord, so it is minor. There are three major and three minor chords in every major key. The major chords are I, IV, and V. The minor chords are II, III, VI. The character of a major chord differs from that of a minor chord. It’s been said that major chords sound cheerful, and minor chords sound melancholy or introspective. There is one chord we have not yet discussed in regard to major/minor. It is the VII chord. If you play a VII chord you will notice that it is not very “pretty” (again, a VII chord is not a 7th chord). If you count the steps in each of its intervals you will see that it has 1½ steps in both thirds – fewer steps than the other chords. Therefore, it is called diminished and is neither major nor minor. Chords can also be inverted. You might think of it as “yoga for chords”. For instance, play a C triad and then, move the lowest note up an octave. You now have 3, 5, and 8. This is called an inversion. You have changed the order of the notes, but still have the same note names in the chord, though one of the notes is in a new octave. In this new configuration, which is called the first inversion, the name of the chord is the name of the highest note rather than the lowest note. The chord is turned upside down; the lowest note is now the highest note. It is still a C chord. Now move the second note of the original chord up an octave. Now you have notes 5,1,3. This is the second inversion. In this configuration, the name of the chord is the middle note. It is still a C chord because it still contains the same note names, even though some are in a new octave. Now, move the third note of the original chord up an octave. You now have 1-3-5, a triad one octave above the original triad. You can do the same process with a full (four-note) chord. Inversions are useful for providing variety in your arrangements, and they are also useful when you have an instrument with a limited range of notes. This is not a complete tutorial, obviously. There’s more in past posts and probably will be more in future ones. But if you keep your ears open, you can get good information from many sources. By popular demand! Laurie’s autobiography! A must-read for all musicians! This life story expresses the challenges and joys of becoming a successful professional musician, from earliest childhood influences, through detours and uncertainties, and through the career that has been my lifelong passion. Formerly, I wrote about a portion of my touring life in my books “All Roads Lead Home” and “More Roads Lead Home”, but this complete autobiography explores all the years previous and all the years since those were written, to contain a wealth of experiences and insights. I am thankful for this honor! 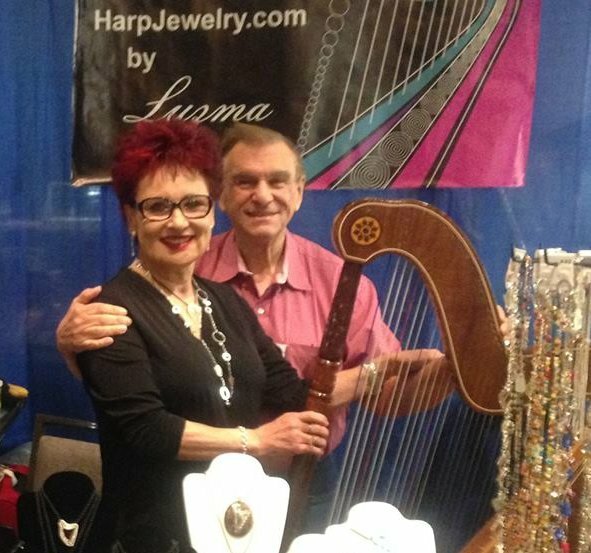 Harp pioneer Laurie Riley has been there, done that! When Laurie Riley took up lever harp in 1981 there were very few musicians playing the instrument and very few harpmakers making folk harps. 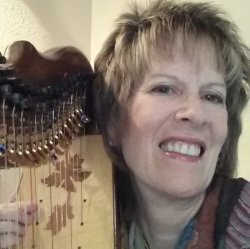 Laurie Riley is this year’s Lifetime Achievement Award recipient, recognized for her pioneering work in three facets of harp which we now take for granted. We recognize her early and on-going work in ergonomics and harp. With her background in anatomy, she held the first-ever ergonomics class for harpers in 1987 and saw such dramatic positive effects that it became a major teaching focus for her, including her creation of a certification program for Music Ergonomists©. 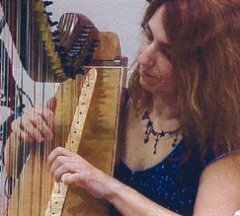 By 1990 Laurie began looking for ways to augment what she wanted to do on harp and explored Welsh triple harp techniques but couldn’t get the sound she wanted. She met Liz Cifani (who sometimes played two harps at once) and they came up with the idea of two rows of strings with levers on each side to achieve the music they wanted to play. They approached Triplett and Stoney End to protoype it and the contemporary double-strung harp was born. It’s been her main instrument ever since and Laurie is recognized as being a leading player. Harp music in a hospital was unheard of in 1991 when Laurie says she “became curious about the effects of music in medical settings” as she played for her own father in an ICU. This was the beginning of the nascent therapeutic harp movement. She was a co-founder of the Music for Healing and Transition Program in 1992 and a charter member of the National Standards Board for Therapeutic Music. In 2002, in recognition of the need for home study, Laurie created the Clinical Musicians’ Home Study Certification Course, now known as Harp for Healing. She continues to actively work in this field. Please join us at the festival at Thursday night’s concert to hear Laurie perform and then be recognized for her achievements in the harp community. An reception in her honor will follow the concert. Ellen Tepper began playing harp at 8 and said she spent years as a “musical singleton.” She never knew that she “had been starved for ensemble playing” until an Irish music session many years later. In teaching and performing she was drawn to creating arrangements to help her students. She began using rounds to reinforce counting and playing with each other and created her new book of rounds, which she’ll debut at Somerset in her Rounds in the Round on Thursday. About Somerset she says, “I always look forward to rooms filled with harps and players, all of us hungry for new material, technique and personal and professional connections.I wish this had been available when I was beginning!” Me too! Alfredo Rolando Ortiz and his lovely wife Luzma have been “regulars” at the festival since its inception! Alfredo was recognized with our very first Lifetime Achievement Award in 2011, marking then his 50 years of harping. If it’s a Latin rhythm workout you’re needing, take Alfredo’s new Cuban Rhythms & Spice or Latin music techniques & fun effects. On your request we’re offering his very popular and essential Prevent Injury twice so you can fit it in your schedule. When he’s not doing workshops, you’ll find Alfredo in the Silverlight booth in the Exhibit Hall with Luzma and her amazing jewelry. Stop in and say hello. They just celebrated their 40th wedding anniversary. F eliz aniversario! There was a big turnout for Deborah’s free webinar preview of the Improv Expansion on March 26. This hands-on playalong gave everybody solid tips and tricks they could put to use immediately in their playing. And of course, I loved DHC’s overview of some of the great presenters and workshops we’re having this summer. If you couldn’t be there, you can catch it on the replay at any time, right in the comfort of your own home. Click here to get the replay page. Check out the Concerts page for who’s playing and when. Bigger hall this year so there will likely be tickets for the general public. Now, enjoyTristan LeGovic’s performance in 2016. See some of our staff and presenters singing the chorus in French and doing a Breton line dance that eventually disintegrates into a Rockettes-style kickline all to Tristan’s impeccable playing and singing. Hilarious. Click on the image to play. 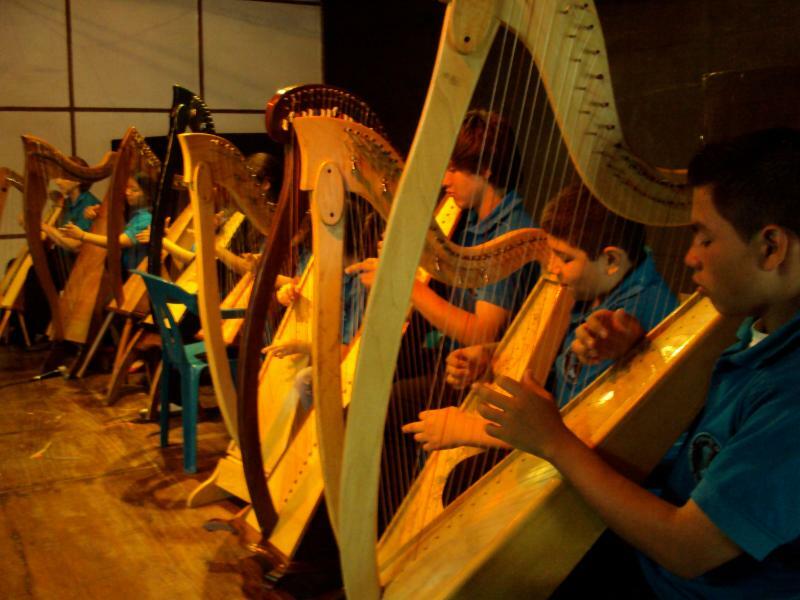 The Guatemalan Harp Teaching Project is a harp teaching program for students in Guatemala City, supported by the New Orleans Chapter of the American Harp Society. 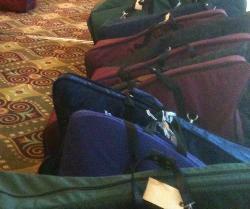 Thousands of dollars of harp supplies have been donated by harpists all over the world since 2003. We had a collection drive for them at our 2013 festival and we’re going to do it again! Patrice Fisher, who is the energy behind this project, credited Dusty Strings with donating more than 1000 strings so they don’t need strings this time. She says, “We need music, tuners, stands, and levers, (especially levers).” We’ll have a collection box at the festival desk. If you’re culling your sheet music collection, bring what you don’t need anymore to the festival to donate. If you upgraded your tuner, bring your old one! You can read all about the program on their GoFundMe page. I’m so appreciative of everybody who gets on a plane or train to get to the festival that I guarantee you a no-cost loaner harp but only if you register by the early-bird deadline of May 1. Besides my own personal stash of harps, my staff and lots of others coming to the festival share their spares with the temporarily harpless. Some of our vendors also stock our harp pool. If not wanting to put your harp on a plane was your reason for not coming to Somerset, I just took away that reason! 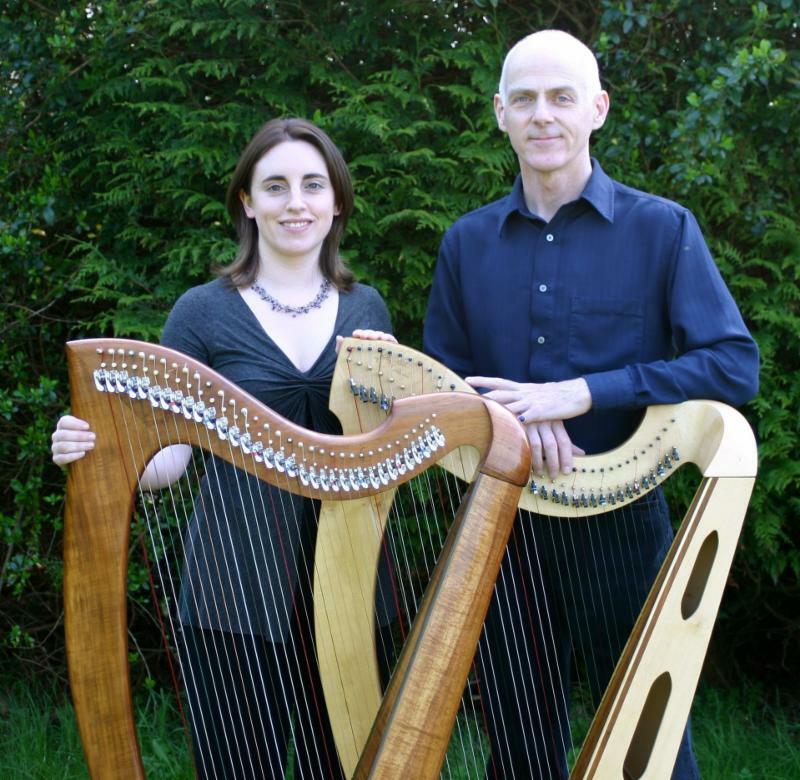 Grainne Hambly and William Jackson will be in the US for their Spring tour, which kicks off April 8. They’re traveling up and down the Mid-Atlantic states from MD to MA so check out their tour page to see if they’re near you! They’ll also be teaching and performing at the festival too. Do a full day with them in our new Harpers’ Escape at Somerset on Sunday, an add-on to your festival registration for only $100 more. That saves $50 if you do it by the early-bird deadline of May 1. If you’re one of the early-birds who has already registered for the festival, you got a special invitation from me on March 29 to download our phone app. Go do it! 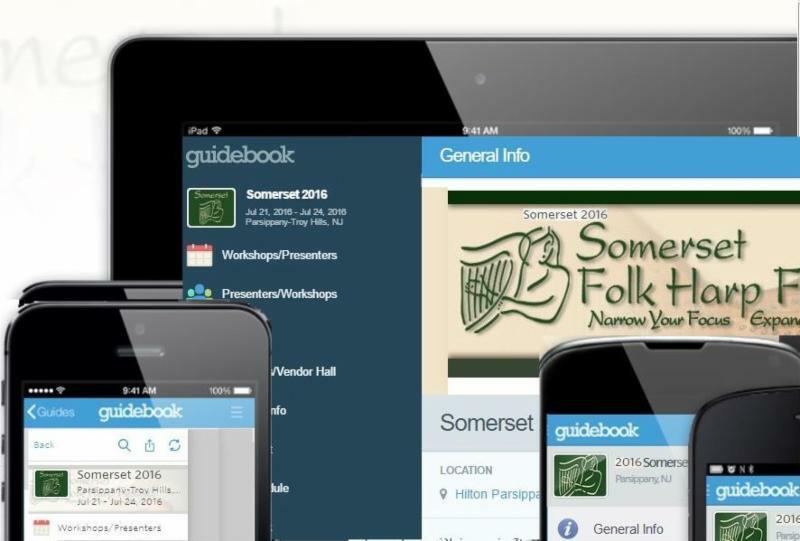 It’s a great tool for creating your personal Somerset itinerary. New registrants will get instructions for getting the phone app in their registration confirmation. The app is limited to the first 200 users to download it! Is Your Music Left-Brained or Right-Brained? Is Your Music Right-Brained or Left-Brained? Although almost no one is completely right-brained or left-brained, most of us tend heavily toward one or the other. A right-brained person is usually defined as someone who is intuitive, expressive, and creative; a left-brained person is usually defined as someone who is matter-of-fact, logical, and precise. Right-brained musicians can be highly emotive, while left-brained ones can be perfectionists and love to develop complex skills. On the downside, the former are sometimes thought of as a bit flakey and not too interested in excellence, while the latter are often considered to be mechanical and unfeeling. I’ve heard people play instruments very expressively but without sufficent structure and ability. And I’ve heard others play with great precision and skill, but little expression. True virtuosity is having equal parts of both technical skill and expression. Since, however, most people tend to be inclined toward one or the other, how do we achieve balance? For the left-brained (logical, precise, technically-minded), learning to be expressive and creative may seem too nebulous. Assuming you have a teacher or a very good learning resource for technical skills, you will also have to do a lot of listening to great performances and ask yourself what elements in the music cause you to feel various emotions? What, exactly, gives you goosebumps? Is it the rise and fall of volume, certain tempos or rhythms, certain chord sequences, or the way the player interprets the timing of a phrase? Some emotion is inherent in the music itself, in the melody, the harmony, the rhythms and tempos as written, but the musician must add the rest. Seek out exercises that teach you to use dynamic variation, and experiment with how subtle changes in volume affect moods from moment to moment. Perhaps more importantly, go out into the woods, sit quietly, and listen. Notice how the distant rushing of a stream creates a peaceful “undercuurent”. How the sudden call of a bird can hasten your heartbeat. How the echo of a wood thrush’s song in the golden light of a spring evening can elate the senses. How the rustling of a meadow mouse in dry leaves can make your ears perk up. How the intrusion of a car passing on a nearby highway can be jarring. How the silences between sounds are important and poignant. All these and more are almost directly applicable to how you can play your music. I can guarantee that time spent deeply observing nature will make you a better musician, no matter who you are. Music is all about telling a story. Some pieces of music tell their own story; others can tell yours. We humans love stories. That’s what music is for; to express all our stories. Be they dramatic, calming, joyful, or mournful, we love them. A good storyteller possesses both technical skill and emotive skill, creates a mood, expresses feelings, and pays attention to structural formulas and elements that make the story work. Most importantly, an audience wants to know you. If they didn’t, they’d go hear someone else. They want to get inside your mind through your emotions, and they can’t do that if you don’t express your emotions musically. They don’t want you to tell them in words or facial expressions or body language (they can get that kind of communication all day every day); that would be like giving away the ending of a great book. They want to experience it musically. Ask yourself what it is in each performer you respect that makes you like their music? Chances are, some aspect of personality comes to mind. Performers are sharing music, yes, but more importantly, they are sharing their souls. As a performer, it’s how you expose, through music, who you are that makes your music compelling. Every performer who has been on a stage with a sound system knows that it adds a dimension that can be either a pleasure or a challenge. Sound systems are supposed to enhance your performance, but sometimes they do just the opposite. Here are some hints to make the sound system experience as successful as possible. Usually there will be a “sound tech” – the person in charge of running the equipment and making sure you sound your best. The tech can make or break your performance, so how you relate to that person and their equipment is important. The majority of sound techs are sincere about doing a good job. They often have challenges to overcome, though, such as temperamental or unfamiliar equipment, strange acoustics in the room, limitations in their own scope of knowledge, and/or performers they may experience as demanding. They may not realize that we performers have challenges, too, such as grumpy instruments, bad lighting, stage fright… you name it. It can be an exercise in personal fortitude to be nice to your sound tech, and they to you, if past experiences have been disasters. But remember, each tech is a different person. Many are skilled and can be a pleasure to work with. A few things to keep in mind: the sound tech can’t make you sound better than you do. They have a hard time if you don’t know how to use a microphone properly. They may not be familiar with your particular instrument. They cringe when their equipment is mis-handled. And they hate being taken for granted. You need to do your homework before you get on a stage with a sound system; knowing what they are dealing with will go a long way. Before any performance you should be given an opportunity for a “sound check” to make sure everything is working right. This is your one chance to see in advance that your performance won’t be plagued by technical difficulties. If something doesn’t sound or feel right to you, speak up! The system usually consists of a “mixing board”, microphones, speakers, and cords (wires) that connect them all. You should only have to deal with using the microphones. The mixing board should be at the opposite end of the room from the stage; this is where the tech sits during your performance to keep sound levels and tone quality adjusted (that’s called the ”mix”). The mixing board should never be on the stage, because the tech needs to hear how you sound in the room. The speakers should be in front of you, facing the audience. If instead you are in front of or too close to the speakers, there will be ”feedback” – a terrible screeching sound that gets louder and louder. In large halls, you may need “monitor” speakers so you can hear yourself. These sit on the floor of the stage, facing you. Controlling feedback is an art when monitors are used, so do what the tech tells you! But do let him or her know if you cannot hear yourself. Be careful not to stand on or trip over cords that will seem to be everywhere on the floor of the stage. Tripping on one can bring down a lot of equipment with you. There will be microphones placed to pick up the sound of your voice and/or instrument. There are many kinds of microphones; each type works differently. Some will pick up your voice from a distance, and some only when you are very close. Some pick up sound from the tip of the mic; some from the side. Some are better held or placed just under the chin; some must be spoken into directly. Some are uni-directional and some are omni-directional. Which type is used will depend on the room you’re in, and whether you’re playing solo or in a group. Once in a while the sound tech only has one kind of microphone and therefore no choice, which can present a challenge if it’s not suited to the situation. That may or may not be his or her fault. A lapel mic may sometimes be used. It is very small and is clipped onto your clothing, and has a wire that runs to a little box that is clipped onto your belt, waistband, or pocket. When you turn your head, the mic doesn’t turn with you, so your voice can fade in and out accordingly. Some people forget about the mic and touch it while gesturing, making a thunderous sound. Some people forget to turn the box on. Some forget to turn it off when they are not on stage, creating extraneous noises through the speakers. Beware of this phenomenon, especially if you’re carrying on private conversations or using the bathroom – you wouldn’t want to be remembered in perpetuity in sound-tech lore. Additionally, some lapel mics have antenna wires that hang from the box, and will react by making strange sounds whenever you come close to large metal objects. If you have such an antenna on a lapel mic, be careful – even metal heater vents and metal chairs can cause problems. Sitting on the wire doesn’t help either. Conventional mics are usually on adjustable stands, of which there are several kinds. “Gooseneck” stands are fully adjustable, depending on the length. They tend to creak when you adjust them, so check that out before performance time. “Boom” stands are common and practical – they have an adjustable angled arm attached to an adjustable upright pole. Why anyone would want to use a stand other than the above types is a mystery, but occasionally you’ll run into a stand that is just a pole that adjusts for height only. Instead of bringing the mic close to you or your instrument, you must bring your voice or instrument close to it. Whatever the stand, treat it carefully. Don’t try to adjust the angle or height without loosening the appropriate gizmo, and don’t expect it to stay in position without tightening the same gizmo. Have the tech show you. Likewise, it’s not a good idea to try to adjust the angle of the microphone itself, unless you know for sure it’s firmly attached to its holder. If it’s in a pressure-fit holder, it can fall out from its own weight if turned the wrong way. Have the tech do the adjusting if you’re not sure. Otherwise you could ruin an expensive microphone. Speak or sing into the mic at a normal volume. Don’t shout; don’t whisper. Don’t play louder or softer than normal. When speaking or singing, if popping sounds occur when you say a P or a T, speak over the top of the mic rather than directly into it. For fretted instruments, usually you want the mic to point at the sound hole or soundboard but not be in the way of your hands while playing. For pianos, it should point to the inside, not the keyboard. For a harp, I find it best to have the mic low on the left side, angled upward toward where the strings enter the soundboard. It has to be low enough to not get in the way of your left hand while playing. If the tech places a mic in a position that is not optimal, ask him or her to move it to where you want it. If at first you are uncomfortable about using a sound system, remember it’s like any learning experience. In time it will become second nature. Why teach? Should you? Do you? What if someone asked you to? Are you ready? Many students regard a teacher as an absolute authority, and many teachers prefer to be regarded as such. Although there are some awesome teachers out there, no one is really a perfect teacher. That is both a good thing and a not-so-good thing. It’s not so good if the teacher is truly under par, obviously. But it is a good thing because if teachers had to be perfect, there wouldn’t be any. Therefore, we mortals are allowed to teach. But taking on that responsibility has to come with integrity. A teacher not only teaches technical skills, but your word and your demeanor can affect a student’s psyche for life. That, too can be good or bad. Bad if you’re someone who says, “You just don’t have the talent to play this instrument,” or “You’ll never be able to sing. Just mouth the words please,” or “You can’t play this if you have a handicap,” or “There’s only one correct technique.” But it’s good if you are supportive, creative, teach to the way a student best learns (aural, tactile, visual, etc.) and accepts that not everyone wants to become a professional. How many times have you heard someone say they quit playing music because they had a teacher who discouraged them? And how many times have you heard someone say that their life was changed for the better by a good teacher? Which kind of teacher would you like to be? Teaching is a great way to learn. Although you’ve heard the adage, “Those who can’t do, teach,” I don’t know what idiot came up with that saying, because it is absolutely not true. I’ve seen some who could “barely do” try to teach, but they don’t last long. The fact is, you must have skills to teach skills. On the other hand, some very skilled people have no idea how to teach what they know. Some try, and end up over-explaining and making students’ eyes glaze over. And there are those who merely teach exactly as they were taught, with none of their own insights in the mix. Here’s the thing: no supreme being reached out of the sky and said, “This is the correct way to teach such-and-such.” We mortals made it all up, and so we teach what works best. If someone says there is only one way because it works better than all the others, that’s a guarantee they have a lot of unhappy students who are not being taught according to their own needs. And there are a lot of instrumentalists, even professionals, who suffer with pain and chronic injury from techniques that are “correct” but which hurt them. But I’ve said enough about all that in the past. Teaching isn’t something we should do only if we have ”arrived”. There is no “there” to which one can arrive. We never stop learning, and hopefully we never stop improving. And if we teach, we learn from teaching. Having to teach something forces us to define it well, understand it thoroughly, and do it well. It keeps us on our toes. We observe and learn about our student’s wishes and needs, and often we become their best friends. How often have you heard someone say, “My life was changed for the better by that student,” or” I wouldn’t be who I am today if it weren’t for my students”? If you, as a teacher, look honestly at your life, you’ll see that those statements are just as true as the ones in which you are the hero. Teaching is a two-way thing. Let it be a dance. The real music is not on the paper. What’s on the paper is a series of symbols. You could listen to that page all day and never hear a thing. Notation is just a guideline. The music is in your head (and your heart). Unless you’re a Mozart or a Salieri, it’s nearly impossible to play expressively without an auditory reference that tells you how the music can sound, or for which to strive musically. Sure, what’s notated might be a lovely arrangement, but the music is not just in the notes. Without expression and nuance, it’s dry and dull. Here’s an example: “Searching for Lambs” is a beautiful tune that is usually notated very simply. If you play it as written, it sounds stilted. It has no expression and it doesn’t flow. Thie first is a simple a capella solo; the second is a full arrangement, and both are very expressive. They’re so differnt from what we usually hear when we just play the notes from the page! Besides being able to hear in your head how the music should sound, it’s also important to be able to play what you hear or imagine. In a previous Post (“We Can’t Hear What’s In Your Head”) I wrote about the dubious benefit of not paying attention to the difference between what you hear in your head and what actually comes out when you play. Remember that your audience has no idea what you’re imagining. That could be a good thing or a bad thing. It’s a good thing if, when your fingers don’t follow your intention, you can ad-lib; few listeners would be the wiser. But it’s a bad thing if what you’re hearing in your head isn’t effecting what’s coming out your fingers. Not realizing how your music is actually sounding is a common malady. We think that if we’re hearing it beautifully in our head, then everyone must be hearing it that way, and all the while our fingers might be producing an entirely different and somewhat undesirable effect that bears little resemblance to what we’re imagining. It’s a good idea to record yourself and honestly listen to what you’re doing. If you’re not up to the standard you want, at least knowing how you’re really sounding gives you the opportunity to fix it. Expression is not just a skill for advanced players. Listen to a version of the piece played well at your skill level. This might mean having your teacher play it for you or maybe even record it for you, or find an appropriate version on You Tube – you can find all kinds of examples there; some are good and some not so good, so you have to choose carefully. Listening to as many versions as possible will give you clues about what’s good and what isn’t. If you have a version in your head that you heard and admired, keep in mind that it’s impossible to play it exactly like the person or recording you wish to emulate – you may be better, or you may be worse, or you may be just different. Every good musician makes the music their own. Although I’m using the term “in your head”, remember it’s also “in your heart”. If you don’t feel something wonderful inside when you play a piece of music, there’s not much point in playing it. If you don’t feel it when you play, few others will. It’s easy to get lost in the technical aspects of playing and forget why we are playing. Sometimes the many repetitions that are required to play a piece well can make it go stale, so here’s what I do about that: I go ahead and let it be just an exercise most of the time in practice, for the sake of practice-makes-perfect. Then, a few weeks before I have to perform it, I start thinking again about how to express it. I get back in touch with whatever it was about the piece that made me love it enough to want to learn it in the first place. I hear it in my head the way I want to play it, and I let my imagination teach my fingers to do it that way. Try it! You’ll love the result! I Want to Sound Just Like…… But Do You? Almost every musician has a favorite other musician they’d like to emulate. Mine is… hmmm… there are so many! On harp, I’d love to sound like Kim Robertson or Harper Tasche. On banjo I’d like to sound like Adam Hurt. You get the idea. Only one trouble: I will never sound like them. If I do what it takes to play as well as they do, I will still sound different. Striving to sound just like your favorite musician is a noble pursuit, especially because it can inspire you to great accomplishment. But think about it: once you reach that goal, what next? Since that musician’s music already exists, no one wants a carbon copy. What they want is something unique. Why sacrifice your true musical identity to sound like someone else? Even if you got all the notes and nuances identical, people would know. You can’t reproduce another person’s soul. Everyone’s music sounds different because no two people have the same personality. You can give the same piece to two equally skilled musicians and ask them to learn it note for note, and when they have done so, you’ll be able to hear differences in phrasing, tone, emphasis, and so on. You will never be that other musician. If you are willing to work for it, you can instead be an equally skilled musician who sounds just like… you. That doesn’t mean you shouldn’t bother to make progress. After all, you have to live with yourself. That’s not fun if your conscience knows you haven’t done your best. Don’t sell yourself short. Many musicians don’t work at this because they believe less of themselves than they are truly capable of. If you push yourself beyond your perceived boundaries, you will probably be surprised at what you can do. SO… how can you become your best musical you? We are ALL still on our way to wherever our best is. Yes, even the most accomplished musicians. Study with musicians whom you respect, and don’t assume there’s a stopping point after which you don’t need to study anymore. Everyone can make progress. There are very few people who cannot become fabulously good musicians. It just takes dedication and a willingness to accept that you don’t know what you don’t know, and you can learn what you need to learn. Never stop learning. Never stop striving for your best. You have a light to shine in the world! The mind is like a puppy: it won’t just automatically do what you tell it to do – you have to train it. Interestingly, training doesn’t just apply to the things we need to focus on, but we also need to practice how to relax mentally and physically, and how to develop the habit of beneficial attitudes, in order for the mind to do what we want rather than going off on its own. And I’m sure you know the mind will go off on its own if we let it. We don’t need to be slaves to the mind’s whims, the stressful thoughts, the fears, the distractions. We own our minds, not the other way around. But untrained, our minds will do as they wish and will run our lives. Everyone who is very good at something has learned to be at cause, not at effect, of their thoughts. As musicians we can – and must – train ourselves to focus and to relax into our music during practice. We can have “Attention Benefit” instead of “Attention Deficit”. Focus and relaxation are intimately related. Focus, unlike what is commonly assumed, is not stressful concentration. It is relaxed concentration, the only kind that works. Stress causes the mind to lose focus. Relaxation enhances focus. I like to call relaxed focus “concentricity” (yes, I made up that word) because it also implies centering. The term “centering” is another term for being aware in a relaxed way of having an inner core from which you can effectively operate. When we relax, we can focus. When we focus, it creates further relaxation. But how do we get that good feedback circle going when we play? Take the time to be sure you are seated or standing comfortably and ergonomically before starting. That’s just as important as the practice is. Create a moment of silence before starting. Do this in both practice and performance. Breathe deeply, visualizing relaxation entering on the inhale, and all else but beautiful music leaving you as you exhale. Make the first note important. While playing, “hear” each phrase of the music just before you play or sing it. Imagine good tone and expression in advance of each note. Put feeling into your music instead of worrying about accuracy during performance: you should have practiced enough for accuracy to happen automatically. Feel the tempo and rhythm. Imagine the beauty of the music flowing through your voice or instrument, out to the audience, back to you, and out again, in a circular fashion, each time becoming more beautiful. Another technique for achieving a relaxed body and state of mind for performance is to arrive at your performance location earlier than you normally would, and after getting everything ready for your performance, find a quiet spot where others won’t disturb you, and sit with your eyes closed. Visualize the stage, the lighting, your instrument, the audience, and breathe deeply. See your music as coming from the center of yourself. (If you have a spiritual practice, you can incorporate it also.) After several minutes, when you open your eyes, you’ll find yourself feeling quite peaceful. I also like to sit for a few minutes as the audience arrives and is seated, watching them from an inconspicuous place. I notice what they are wearing, what kinds of personalities they seem to have, and so on. Sometimes I pick out a few particularly cheerful or friendly-looking people in whose direction I will look when I’m talking between pieces. All of this helps me feel like I know the audience, like they are not strangers. Another practice that I find very helpful: for several minutes just before a concert, I sit quietly and bring to mind all the things in my life for which I am grateful. It’s amazing how many things I can name. By the time I get on stage I am in a great state of mind! Being relaxed in performance is essential. We all know we can’t do our best when we’re stressed. Training the mind may require adopting a contemplative practice that you do every day. Some prefer meditation, some contemplative prayer, some enjoy various mindfulness exercises. Even walking in the woods and noticing very purposely every plant, animal, color, and sound, is a mindfulness exercise that promotes the production of endorphins which are beneficial to the body and mind. All of the above activities have been shown through research to enhance the immune system as well. One last idea: try expressing your emotions through your music. All of them, not just the “good” ones. Studies have shown that it is the appropriately channeled expression of all of one’s emotions that enhances the immune system and keeps us healthy. Make a habit of these things and see how your music becomes a joy to play in any situation!